Like most countries, France has its own unique take on Christmas. With that in mind, here are our top tips of how to get the most out of a festive trip to France. France is known for its Christmas festivals and similar events to celebrate the winter season. Possibly the largest is in Lyon, where a huge festival of lights happens each year. 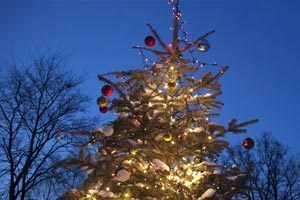 There are countless events that happen across the country however, with most cities, towns and villages at least having a Christmas tree. Like the festivals, French Christmas markets are important also. The country is well known for its plentiful, character-filled festive markets, particularly in the major cities and towns. Although more common in central and Eastern France, if you can get to one you’re in for a real treat – from hand-made toys to local artisan cuisine. On the subject of food, France goes big at Christmas with a huge variety of festive foods stocked in markets and supermarkets. In preparation for Le Réveillon (more on that shortly), ingredients such as truffles, scallops, snails, deer, pheasant and foie gras all become more available. Desserts are naturally not left out, with Bûches de Noël (or Christmas logs) very popular, along with many other fine cakes and pastries. The idea is to increase the luxury of the food available around Christmas. Of course, it wouldn’t be right if the food wasn’t linked to French wine. The French people tend to open the vintage bottles at Christmas – be it wine, Champagne, sweet wines and liqueurs. Care is taken to accompany the alcohol with food style, increasing the impact of the experience. As Christmas approaches, Christmas Eve is actually when celebrations in France really get serious. Commonplace is for locals and families to gather for a large community meal called Le Réveillon, which runs into the early hours of Christmas day with a break at around midnight. This break is normally to allow for children to open their presents.